Ducklings are somewhat easy to raise although baby ducks need lots of love and attention. If you have just received a duckling as a gift, hatched the fertile duck eggs yourself or purchased baby ducks from a hatchery, there are a few things you should know before you take your new baby ducks home and start trying to raise them. First and foremost, never leave your ducklings alone in a pond or pool with adult ducks. Adult ducks can drown ducklings. So if you have adult ducks, keep them separated from the baby ducks or tend to the ducklings the entire time they are in the water with the adult ducks. Start your ducklings off in a safe and warm environment:a duck brooder! For the best environment use a heat lamp with between a 40 and 100 watt light bulb. You can adjust the bulb wattage according to the way the ducklings react. If the baby ducks are huddling under the heatlamp, you probably should raise the wattage on the bulb. If the baby ducks are scattered and seem to be panting, you should lower the wattage. Use straw for bedding and never use newspapers or any smooth surface. This can cause leg problems for the baby ducks in the future. The ideal brooder when raising baby ducks for the first few weeks is a plastic crate or carton. You can purchase a plastic storage carton anywhere and they make great cages for ducklings. Once the ducklings you’re raising are larger and beginning to outgrow the crate, you can build an outdoors coop like you would have for chicken coops. Just make sure the duck coop is predator resistant. Remember, raccoons, cats and foxes will eat your ducklings until they are bigger and can fly away from them. A commercial duckling feed can be purchased at any poultry feed supply store. It should be prepared for water fowl and used for the first 4 – 6 weeks. Do not feed baby ducks bread! Bread swells when wet and can choke the baby ducks you’re raising. Always ensure there’s enough when feeding ducks. When raising baby ducks, make sure you provide the ducklings with fresh, clean drinking water. You can use a shallow dish that you have added some clean pebbles to. The pebbles will prevent the ducklings from submerging their head and drowning. They need to submerge their head in order to clear their sinuses but any deeper than the nostrils can drown them. Adding a small amount of sugar to their water for the first few days can get them off to a good start. Your duckling should be fully feathered before allowing them to swim. After they are feathered and begin swimming, do not leave them unattended. Ducklings need to get out of water quickly if they get too cold or begin to tire. 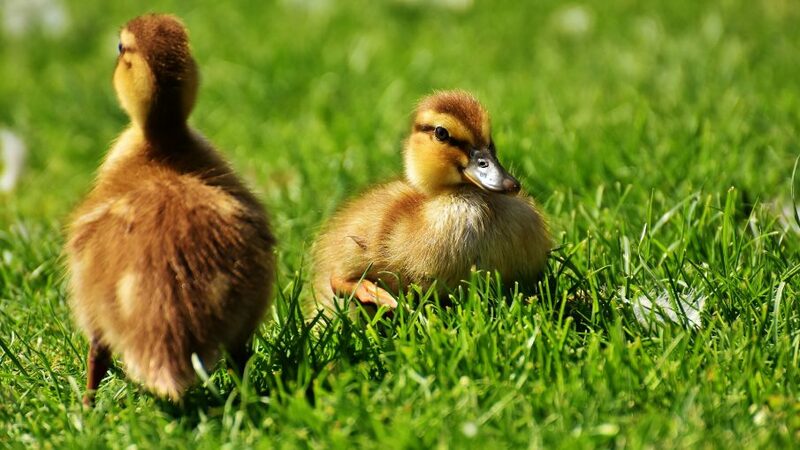 After your ducklings have grown, they will most likely stay in the same area year after year. Rarely do adult ducks not return to their home pond. If your duck does not return, it either found a mate and returned to their mates pond or something has happened to it through the winter.